It’s true. And the opposite is true. If I don’t seek God, I can’t expect to find him. I won’t know him. My 3 1/2 pound brain just can’t comprehend all of him. My goal is to seek to know and understand more of him every day, every week, every year. I have decided that I will be on this journey towards the Truth for the rest of my life. And, when my journey on earth ends, I’m going to know God better than I know him now. I am going to understand him better than I understand him right now. Because, when I seek him, I always find him and it’s all good. David knew this to be true from his own personal experience. He also understood that Solomon would need to seek God for himself in order to be the king God wanted him to be. David realized that Solomon would not hear God, not understand God, not know God unless he spent significant time and effort in seeking him. The same is true for you and me. There is no magic to growing in my knowledge of and faith in God. It takes a lot of time and effort. I have to willing to open my heart so God can change the things I love to the things he loves. I have to willing to open my mind so God can transform my thoughts – etching his truth over old lies and self-centered thinking. I have to read and study his Word and then let his Word come alive in my life – effecting the things I say and the things I do. It takes perseverence and commitment. But there is nothing that is more worth the time and energy and effort. 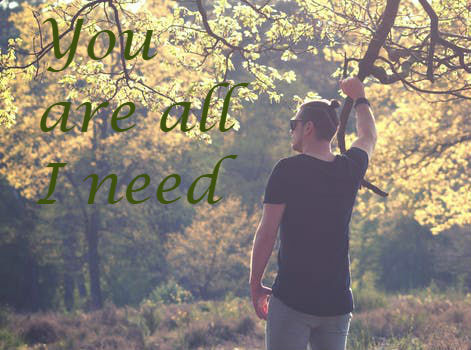 You are all I need, Abba Father.